What’s amazing is that even without advanced knowledge with mathematics, and without drawing plans on paper, weavers are able to create complex geometric designs by hand. These complex geometric designs depicts advanced levels of geometry and algebra using a combination of a weaving and counting technique. Different finite designs and repeating patterns occurring in different Philippine ethnic communities are being studied today through the analysis of their symmetry groups and colored symmetrical structures. 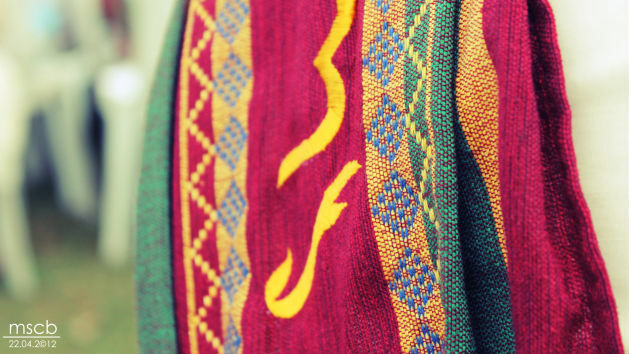 Repeated patterns are basic discrete design elements and these symmetrical patterns (called a motif) are not only seen in mats, blankets, etc., it can be seen in our very own sablay! A simple example of some of the symmetries in sablay: see those blue diamonds? They are moving along a line. This kind of symmetry is called “translation” – a shift of the motif by a given distance in a line. I don’t remember myself hating math, in fact, I think I am very open and excited when it’s math time. I remember how the challenge of solving math problems (kind of) trigger the “competitive” me. Until the 1st half of my high school life, I think it was good. But it just became more and more challenging (and my math teacher/s were just way too intimidating for me that I can’t ask them for help #shytype hahaha jk) that even though my competitiveness is triggered, it was overpowered by anxiety and nervousness that sometimes, I just can’t get over with. But truly, I do not hate math, I still find it interesting. I just need the right motivation and understanding as to where I’d be able to use all the things that math offers.